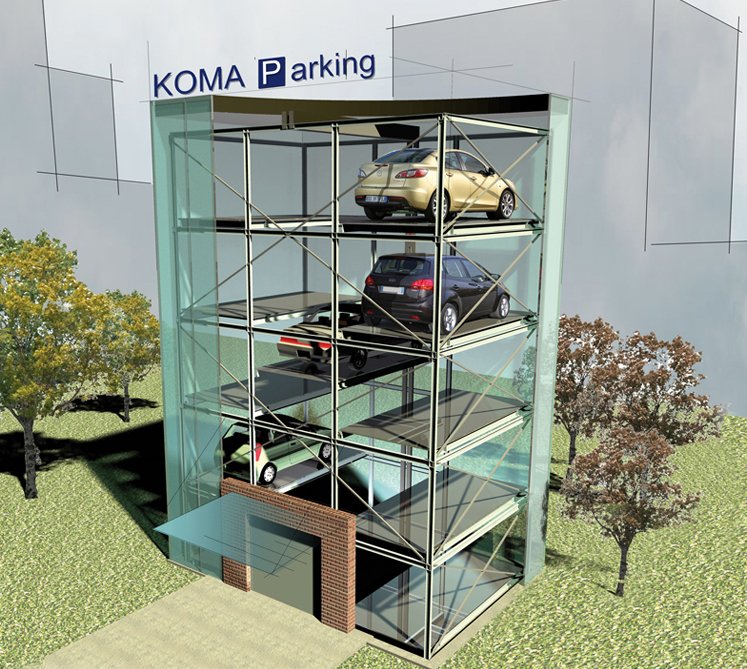 An automatic system for independent parking, based on stacking cars and shifting pallets to either side of the lifting device. As required, several installations can be placed side by side or linked one after another. The system is suitable for up to 100 cars. For indoor use only. The systems can be above ground, below ground, and combined. Suitable for subscriber parking and park timing. Making the best of the park space. Suitable for oblong sites of a limited size. The systems can be installed both along the side of a residential buildings and separately. Making the best of the park space. Suitable for oblong sites of a limited size. The systems can be installed both along the side of a residential buildings and separately. 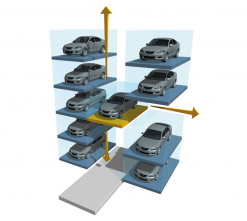 An automatic system for independent parking. As required, several installations can be placed alongside or one after another. Suitable for oblong sites of a limited size (residential districts). Residential districts, new property developments, renovated courts. Space for 1 to 3 cars on both sides of the lift. Up to 20 floors. The drive-in space for 3 cars alongside can feature an optional turntable on both sides of the lift. To accommodate two cars alongside in a turntable installation, the clearing space must be extended. 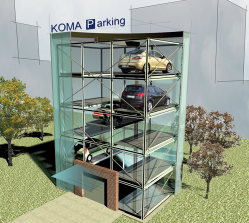 For more detailed information about KOMA Automated Parking Systems, please fill the contact form, thank you. Required items are marked as bold text. Vyplněním a odesláním formuláře uděluji v souladu se zákonem č. 101/2000 Sb. souhlas se zpracováním zde poskytnutých osobních údajů společnosti KOMA-Industry s.r.o., jakožto správcem a případně jinou třetí osobou jakožto zpracovateli, za účelem zařazení do databáze správce a dalšího marketingového zpracování za účelem zasílání obchodních sdělení prostřednictvím elektronických prostředků dle zákona č. 480/2004 Sb., a to na dobu neurčitou od udělení souhlasu. Beru na vědomí, že mám právo přístupu k osobním údajům a další práva dle § 11, 21 zákona č. 101/2000 Sb.. Souhlas se zpracováním osobních údajů uděluji dobrovolně a mohu jej kdykoli bezplatně na adrese správce odvolat. International Machinery Fair 2003, and 2003 Transport and Logistics fair.